1. Determine what is most important to your office, Quality or Cost. Office coffee service providers offer an array of products from fresh locally roasted coffees to mega-corporation coffee like Folgers. Local coffee roasters can often provide a substantially better office coffee service to the consumer for a slightly higher price and you get a better overall product. 2. Choose the coffee service company that offers the best equipment. Many providers will skimp on the equipment they use to cutback on costs. A faulty machine can cause problems in maintenance and in consistency. Too often machines will break down. The best coffee in the world can taste mediocre when brewed with shoddy equipment. 3. 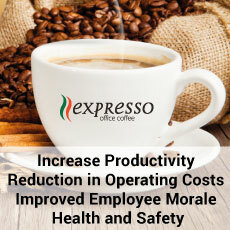 Look for a break-room office coffee service provider who provides exceptional customer service. A few key things to note when interviewing your provider is to ask them how often they clean the machines and how quick they’re to respond to requests for maintenance and service. A good coffee service provider should be able to provide same or next day service for your requests. 4. Always ask for references. A good coffee supplier should be able to provide numerous references for any job they’re bidding on. Depending on the size of the account, you should ask for references that are similar to your company. Make sure to call the references and ask them about their service. 5. Know that iron-clad contracts aren’t necessary. An office coffee service provider who requires an iron-clad contract is something to be wary of. A good coffee supplier should rely on their strength of product and exceptional service to keep an account. Too often businesses get stuck in 1 year, 3 year, or even 5 year contracts with a coffee service provider only to find out that the customer service is careless and the product is abysmal. If you have to sign a contract, make it no longer than 1 year and ask for an out-clause. 6. Insurance: request the potential provider for proof of General Liability Insurance. 7. If you’re looking for Quality, avoid companies that also do beverage & snack vending because it is a completely different business. In the Beverage & Snack business, when the vending companies go to the wholesaler they look for the products that are on promotion because it maximizes their profits, so you can be stuck with not only low quality but an ever changing coffee taste. 8. Never buy the machine. Many companies believe that by buying the coffee machine they will save money, this not true, if the machine is yours you are liable for repairs and if it breaks and is un-repairable you just threw away hundreds if not thousands of dollars. If the machine is owned by the office coffee provider it is in his interest to maintain the machines in perfect condition. Also, ask the potential provider if he has replacement machines in case there is a major breakdown of the machine he wants to install. 9. Read the Service Agreement in detail. It is not uncommon that some suppliers factor their contracts to financial firms; you will know this if on the agreement there is a different company name to that of the provider. Avoid this if you do not want to be tied in to an agreement with a financial institution. Also make sure that the agreement stipulates what the service includes, i.e. if your plan includes 500 services/cups it should say so; don’t let this slip.